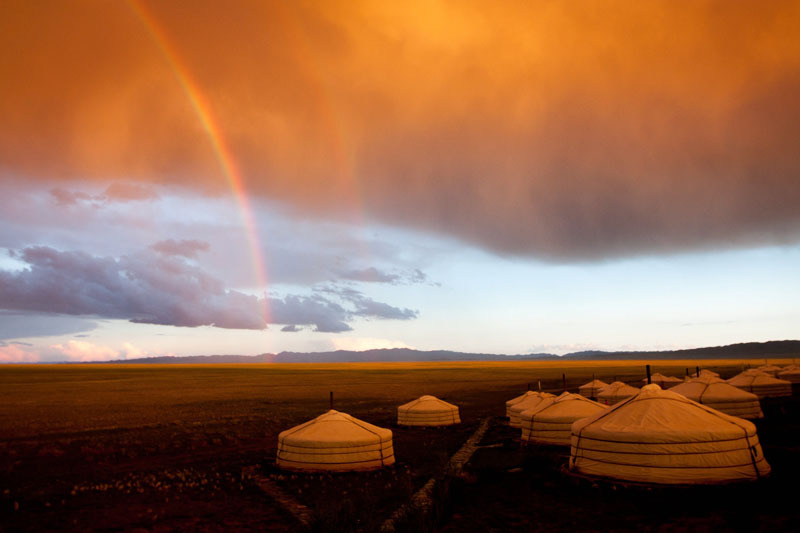 Mongolia is a land of vast horizons of steppe and desert bordered by remote, pristine mountain ranges. Famous for its untamed landscapes, Mongolia is a dream for the outdoor adventurer and a warm, welcoming destination for all travelers. The land of Chinggis and Kublai Khan, the Mongolian Empire once extended east to Korea, south to Vietnam and west to Hungary and its warriors were feared and ruthless conquerors. Rarely accessible to the outside world until recently, travelers are discovering the natural gifts of this amazing country; wide open vistas, unparalleled star gazing, horseback riding, fossil hunting, and overnights in traditional round yurts or gers in a land of rosy-cheeked smiles! 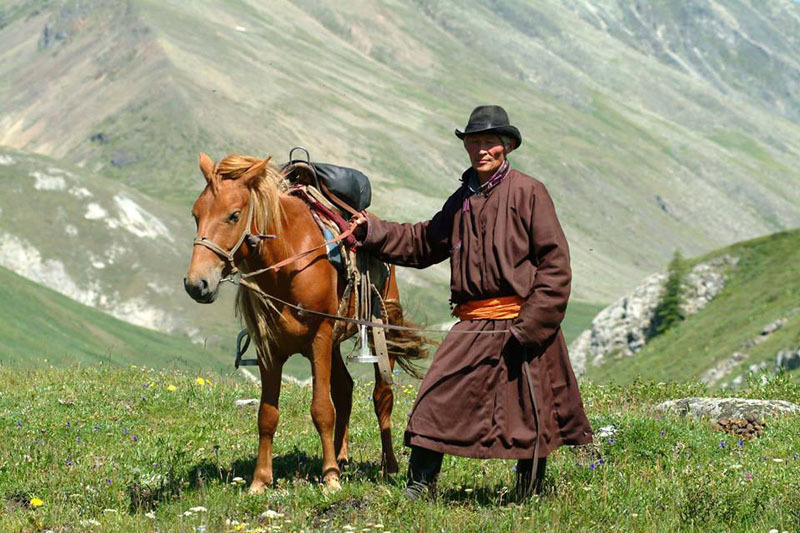 An oasis of unspoiled beauty between China and Russia, Mongolia has one of the sparsest population densities in the world and a culture dominated by Tibetan Buddhism, shamanism, and nomadic culture. 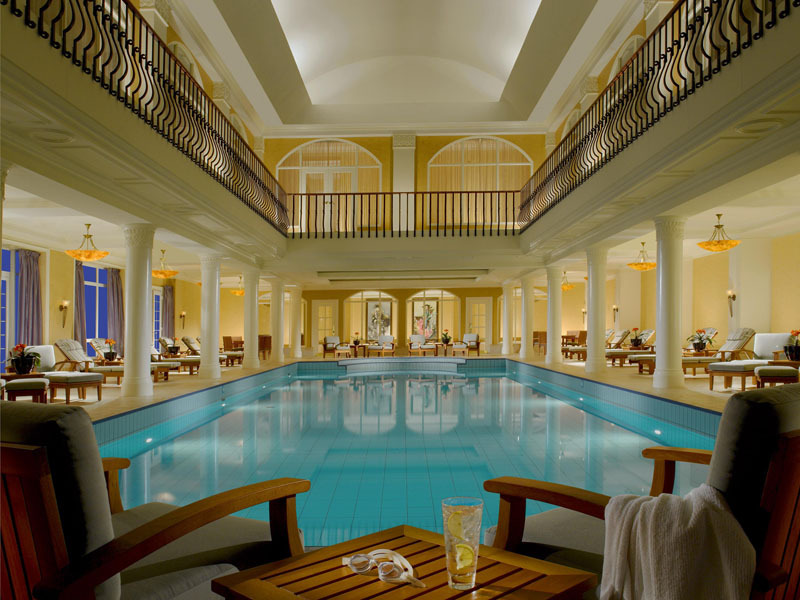 Even Marco Polo was at a loss for words to describe all he'd seen there. All visits to Mongolia start in the capital city of Ulaan Baatar, set in the valley of the Tuul River. It is home to a third of the nation's population and tradition thrives among blocks of Soviet-era architecture and suburbs of gers. Tuts –small independently owned street kiosks line the streets, milk is sold out of old-fashioned farm cans and devotees spin Buddhist prayer wheels in the temples. 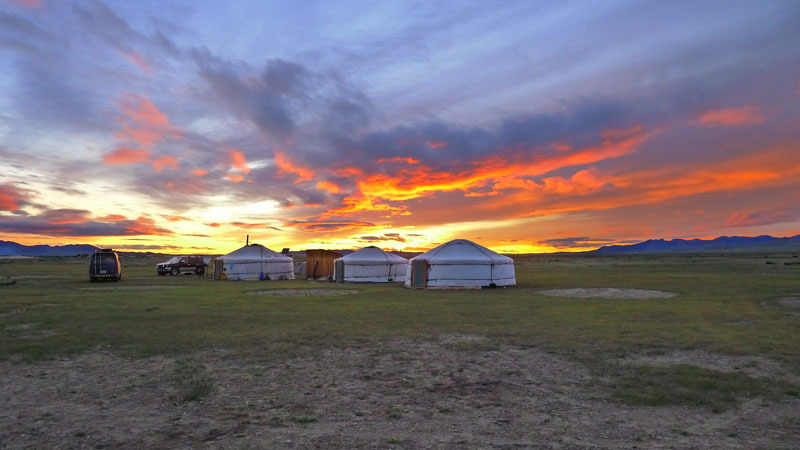 Experience Mongolia like the Khans on this luxury tour to the land of endless sky. 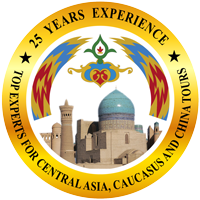 Upon arrival at Chinggis Khan International Airport, you will be met by your professional tour guide and transferred to your hotel in the city center. After breakfast, we'll start with a city sightseeing tour. The first stop is at imposing Sukhbaatar Square, the central square originally named after Damdiny Sukhbaatar, the revolutionary hero of 1921 who declared independence from China. Around the square are the Parliament House, Stock Exchange, Opera and Ballet Theatres, Museum of Mongolian History and the Cultural Palace – home of the National Art Gallery with its fine collection of vibrant Mongolian modern art. Stroll the square and enjoy the hustle and bustle under the watchful eye of the mighty bronze Sukhbaatar on horseback and a seated, mighty Chinggis Khan at the north end. Next, the Gandan Monastery was once home to over 5000 monks and like all religious communities in Mongolia, was destroyed during the Stalinist purges of the 30's, leaving only a handful of temples as barracks and stables. Reopened in 1944 under strict Soviet supervision, today it is the largest active Buddhist temple in Mongolia. With over 800 monks it houses a new, gold-plated, 40-metre high Buddha. Time permitting we'll visit the temporary home of the famous dinosaur skeletons of Mongolia. The entire city is spread out below you from your vantage point on Zaizan Memorial Hill, with its colorful, circular Soviet memorial to unknown soldiers. 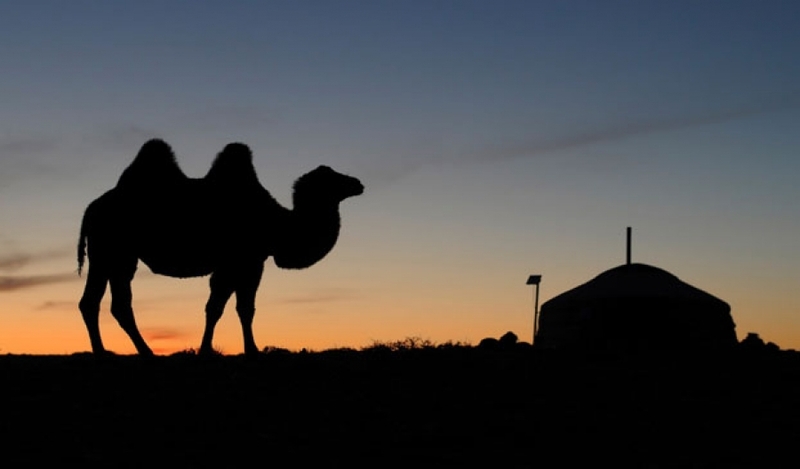 This morning your short flight will take you over the vast steppe to the lands of the "lost country" - the Gobi Desert, Mongolia's southernmost province. There are supposedly 33 different words for "sand" in the native language, where truly only a tiny percentage of the area here is actually the dry, desolate desert of the imagination. The rest is semi-arid steppe and foothills, sparse vegetation, even ice canyons and dramatic rock faces guarding a treasure trove of dinosaur fossils and populated with Bactrian camels, ibex, and birds of prey. Meet your driver upon arrival and then transfer to 4WD vehicles more suited to the terrain. We'll drive to the Yol Valley in the 2.7 million hectare Gurvansaikhan National Park, situated in the foothills of the Altai Mountains. This region and its wildlife has been protected since 1965, one of the last habitats of the Argali mountain sheep and the snow leopard and a safe haven from the desert heat. On the way to the lodge, we'll stop to visit the local Natural History Museum for insight into the flora and fauna of the area. Tonight we'll experience nomadic life at the Three Camel Lodge, where it feels as if you've stepped into another century and into the lifestyle of the great khans. Environmentally and culturally sustainable, this luxury ger accommodation in the desert offers tranquil comfort and top-notch service. 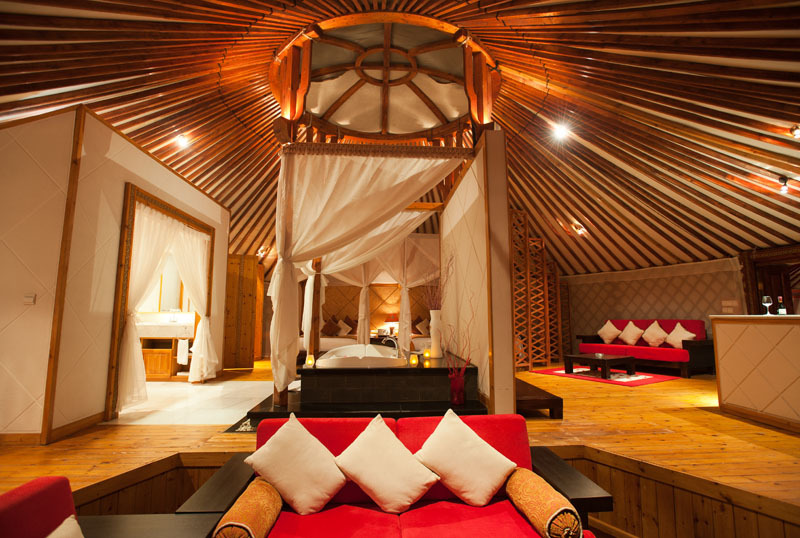 Constructed of latticed wood and covered with layers of colorful felt and canvas, each ger has its own cozy wood stove and is furnished with beautifully decorated wood furnishings. Following breakfast, we will take an archaeological safari to Bayan Zag or "The Flaming Cliffs" on the trail of paleontologist Roy Chapman Andrews and his team from the American Museum of Natural History. It was here, in 1922 among the bright orange sandstone formations that they discovered the first known nest of dinosaur eggs, changing our understanding of the Oviraptor and of dinosaurs in general. This area is rich in fossils from the late Cretaceous Period and a mecca for paleontologists. 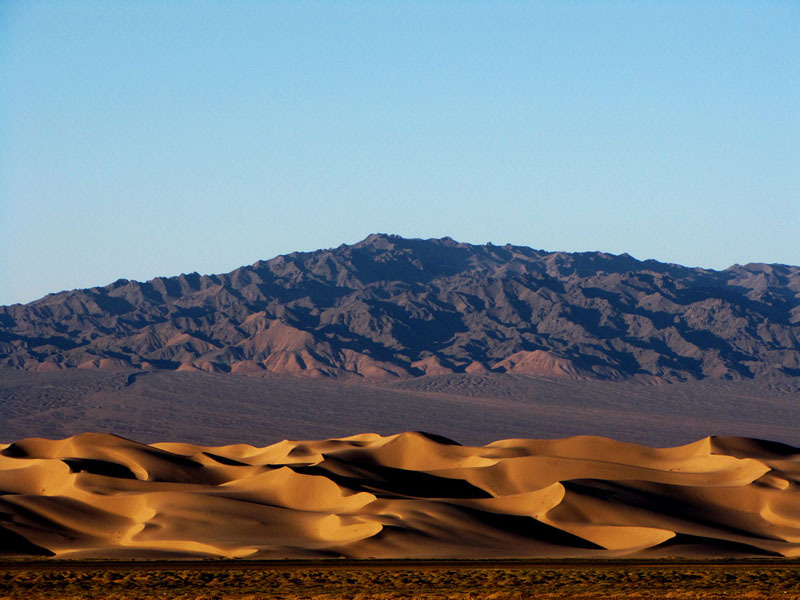 Nearby are the rolling waves of the Moltsog Sand Dunes, your chance to experience the Gobi. 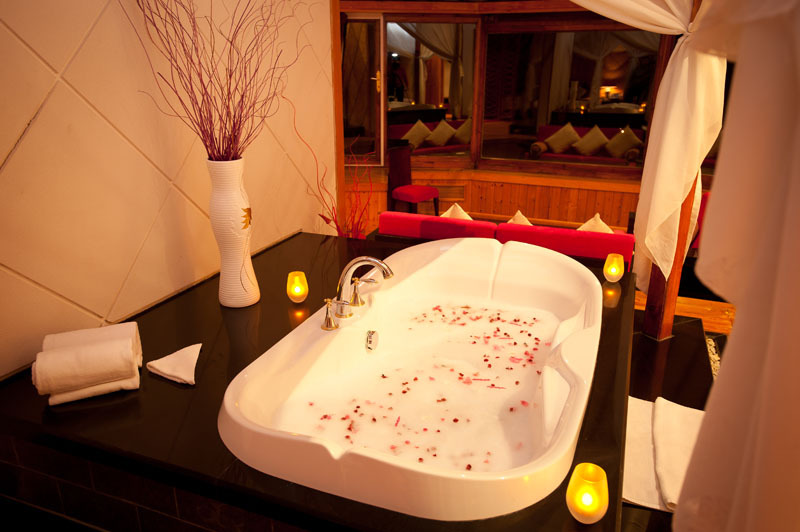 Once back at our accommodations, perhaps this evening might include entertainment by local performers of music, dance or even hoomii – Mongolian traditional throat singing. Carefully trained male voices produce harmonic overtones from deep in the throat, releasing several notes at once, as if produced by musical instruments. Spend the day with a nomadic camel herding family! The door to the ger is always open and a cup of suutei tsai (salty tea with milk) is always waiting. In a country of no fences or locked doors, it is impolite to knock and the rigorous climate and nomadic lifestyle has engendered long-standing traditions of friendliness and hospitality. Be as active as you wish; walking, riding camels, or horses, take an archery lesson, learn about felt-making, herding, milking and learning to care for the livestock. There will also be opportunities to learn about making yogurt, cheese curds or even huushuur (fried lamb dumplings). This evening's meal will be khorhog, a traditional Mongolian barbecue dish. Khorkhog is made by slow-cooking pieces of meat and vegetables inside a metal container with hot stones and water, much like a savory, tender stew. In the morning, we will drive to the airport for our flight back to Ulaanbaatar and then you'll have the rest of the day to explore more of this fascinating city. Your guide can help you plan your time. Take a leisurely stroll through the town center. Along the southern edge of Sukhbaatar Square is Peace Avenue, Ulaanbaatar's main thoroughfare you'll find a wide variety of stores and restaurants. Shop for luxury cashmere, silk, and wool clothing, rugs and handmade felt boots in the shops, stalls and in the State Department Store. 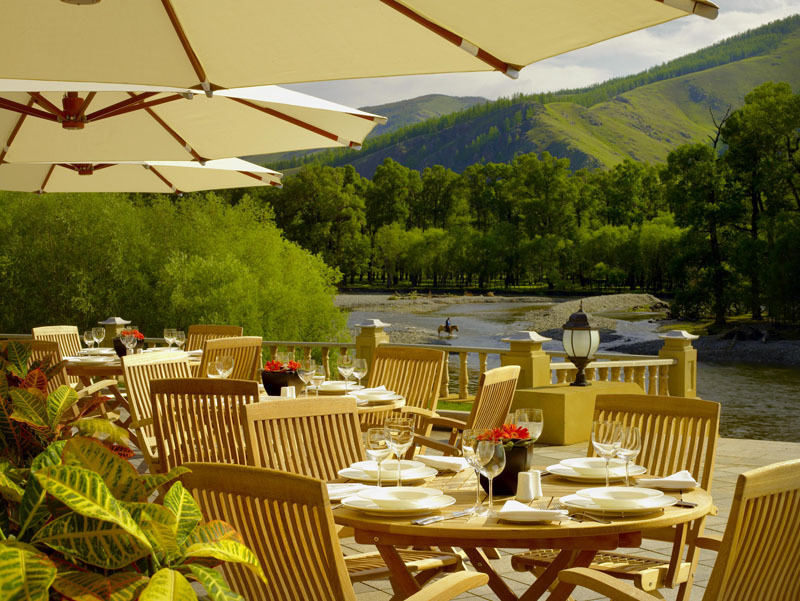 Enjoy a meal of any one of dozens of international or Mongolian cuisines in one of the many restaurants or cafes nearby. Explore more of Mongolia's cultural history at the National History Museum's displays of traditional nomadic life, costumes, and religious relics. The Torgo Fashion Museum illustrates Mongolia's intricate fashions and styles of the minority tribes here. The Bogd Khan Palace Museum, once the winter residence of the last monarch Bodg Jabzan Damba Hutagt VIII. Built between 1893 and 1903 it contains collections reflecting his life and times. There are rich silk robes and hats, decorated thrones, ornamented sleeping chambers and a collection of the gifts given to him by governments and visitors. The original Summer Palace was lost to fire in the late 1800's but the complex of seven temples still stands behind the Spirit Shield wall of blue bricks and the Three Open Gates which allow only good influences to enter. In the evening, a seat at a local folk performance can be arranged. The flights and hotels can be changed without prior notice. The Nadaam Festival. 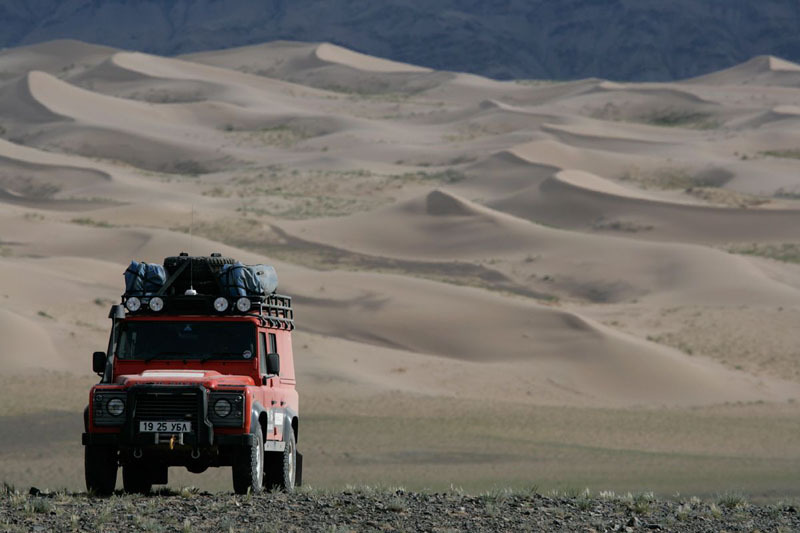 Should you be travelling to Mongolia in July, this is not to be missed! On the 11th of July, this annual festival in the nation's capital displays the best of Mongolian traditional sports and games. Highlights include over 600 riders between the ages of 5-12 racing for 20km across the plains. Women and men in traditional robes take part in archery competitions. A Mongolian bow can take up to a year to make and Chinggis Khan conquered an empire with his mounted archers. Over 500 wrestlers take part in untimed single elimination bouts in this fast paced test of strength and endurance. Paragliding, Canoeing and Fly Fishing are popular activities in Mongolia and can be arranged as additional tour options at your request. Vehicle or room upgrades where available.